Bretheren, for what things soever were written, were written for our learning: that through patience and the comfort of the scriptures, we might have hope. Now the God of patience and of comfort grant you to be of one mind one towards another, according to Jesus Christ: That with one mind, and with one mouth, you may glorify God and the Father of our Lord Jesus Christ. Wherefore receive one another, as Christ also hath received you unto the honour of God. For I say that Christ Jesus was minister of the circumcision for the truth of God, to confirm the promises made unto the fathers. But that the Gentiles are to glorify God for his mercy, as it is written: Therefore will I confess to thee, O Lord, among the Gentiles, and will sing to thy name. And again he saith: Rejoice, ye Gentiles, with his people. And again: Praise the Lord, all ye Gentiles; and magnify him, all ye people. And again Isaias saith: There shall be a root of Jesse; and he that shall rise up to rule the Gentiles, in him the Gentiles shall hope. Now the God of hope fill you with all joy and peace in believing; that you may abound in hope, and in the power of the Holy Ghost. Out of Sion the loveliness of His beauty: God shall come manifestly. Gather ye together His Saints to Him, Who have set His covenant before sacrifices. Alleluia, alleluia. 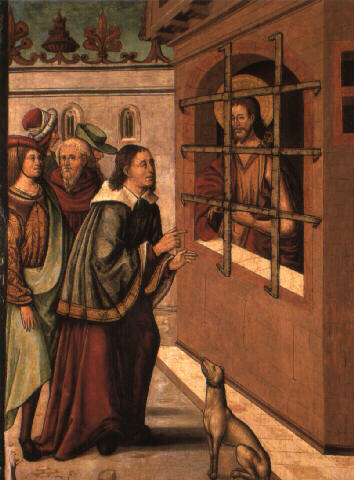 (Ps 21:1) I rejoiced at the things that we said to me: We shall go into the house of the Lord. Alleluia. from your body and from the pleasures of the senses, so that nothing seems to be left in you but your soul, which you are concerned about exclusively and which is the only object of your care. For you are destined by God to apply yourselves, like the holy angels, only to what refers to his service and to the care of souls. In you, as Saint Paul says, the outer man must decay, so that the inner man may be renewed day by day. You must become like the angels and like them, as the same Apostle says, not consider things that are visible but only those that are invisible, for, he continues, the former are temporary and pass away, whereas the latter are eternal and will be forever the object of our affection. As we continue through the Season of Advent, let us all remember in our prayers those who are suffering or who have died as a result of terrorist atrocities throughout the world; especially those murdered in San Bernadino, California and Paris; let us also pray for all those who are suffering, both Christian and Muslim, in Syria and Iraq at the hands of the D’aesh terrorists and their murderous mediæval ideology. Let us also pray that through the efforts of not just our own security services but those of our allies the world may be kept safe from the scourge of terrorism and religious fanaticism.